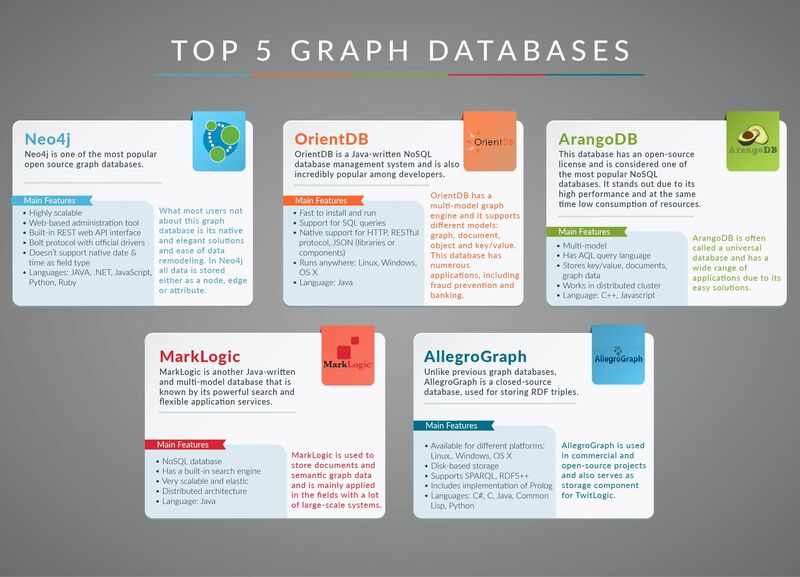 There is a great variety of graph databases that differ in language, purpose, etc. We will have a look at the most notable ones and their core features. Graph databases are essential for the companies dealing with Big Data, as they represent the data in clear and simple visual manner. At the same time graph databases allow to play around with data, improve company overall performance and support agility, which is critical in constantly changing business environment. However, there is a great variety of graph databases that differ in language, purpose, etc. We will have a look at the most notable ones and their core features. These graph databases are some of the most popular and known; however, there are much more than that. When choosing a graph database, first define the purpose for its use and then check whether its features would fit your requirements. We’ve also come up with a list of graph database advantages that you may want to consider. Performance: Graph database performance stays constant even as your data grows, which is a huge plus considering the great amounts of data that companies are dealing with. Flexibility: With graph databases, IT and data architect teams keep up with the business because the structure and schema of a graph model flex as applications and industries change. Rather than exhaustively model a domain ahead of time, data teams can add to the existing graph structure without endangering its current functionality. Agility: Developing with graph databases aligns perfectly with today's Agile, test-driven development practices, allowing your graph database to evolve in step with the rest of the application and any changing business requirements. Modern graph databases are equipped for frictionless development and graceful systems maintenance. In addition, graph databases allow deep traversals faster than Relational. And some of them allow very fast execution of complex pattern matching queries and compact representation of the data, basing its implementation on the bitmaps.